Tempo AI has launched a new sophisticated personal assistant application for your mobile device that is designed to help prepare you for your next meeting. Called the Tempo Smart Calendar, it is a service that not only takes your appointments, but adds in all the relevant information you’d need in order to be productive. It was created at SRI International, the independent non-profit research institute that created Siri and her travel-related sibling Desti. Started in August 2011 by mobile veteran Raj Singh, Microsoft veteran Corey Hulen, and Thierry Donneau-Golencer of SRI, Tempo has been called the “first intelligent calendar” that is context-aware in order to make sure the your engagement with it is personalized, but also learns from your interactions, understanding patterns and behaviors, in order to give you an optimized experience. We spoke with Singh at length about Tempo and why he decided to choose to work on calendars. Prior to starting the company, he had been a software engineer and product manager, most recently at the mobile browser app Skyfire. After leaving, he was recruited by SRI Ventures as an Entrepreneur-in-Residence where he began to look at problems he had when handling business development. Eventually it hit him that with all the meetings and information scattered around different places, he was becoming a slave to his calendar. With that, the idea of Tempo AI was born. Singh tells us that the smart calendar approach was chosen because it’s a hybrid between two different types of assistance: push and pull. Siri is pull-based because you ask a question and you get an answer. On the other hand, Google Now is considered push-based because it tracks everywhere you go and pushes things to you, the majority of which, according to Singh, is pretty noisy. In these instances, you have the “Cheerios problem”, where you might wake up each morning presented with a coupon for Cheerios, but you’re not looking for it at that moment. Tempo hopes to make your life easier by using its mobile productivity app to analyze data from your native iPhone calendar. It imports your events and applies artificial intelligence and machine learning to provide more contextual information for your meetings and events throughout the day — by that we mean that it not only looks at the date and location, but provides driving directions, derives contact information for the event organizer, and looks through authorized email accounts and pulls in the important communications so that you’re prepared. 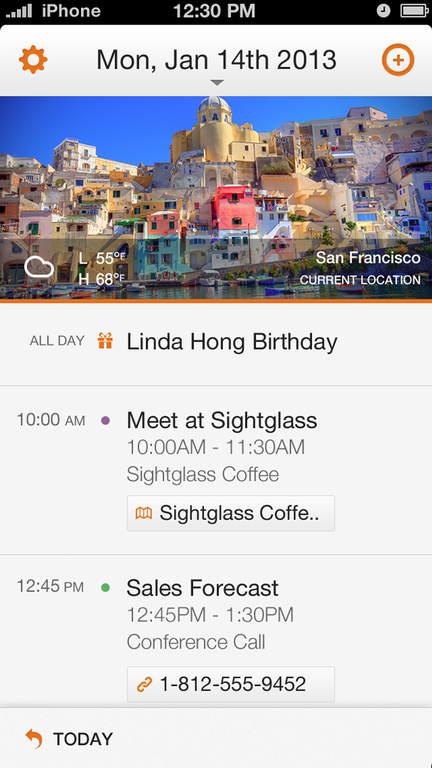 The app syncs with any number of calendars that’s imported into the iPhone. 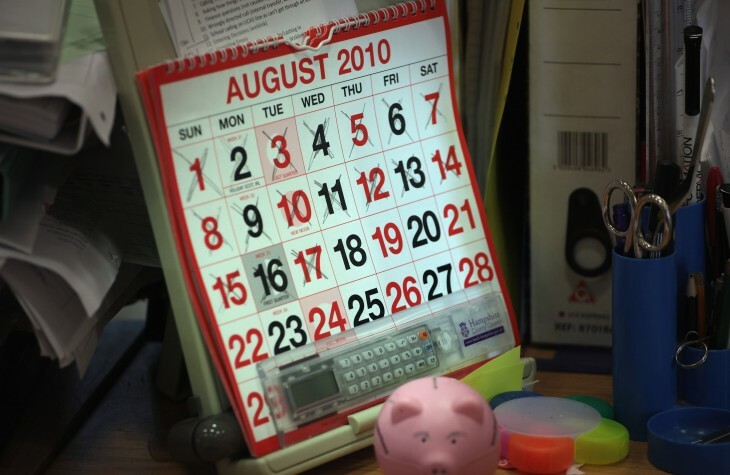 Once there, it can be used as the default calendar. Simply enter in a meeting into the Tempo Smart Calendar for iPhone app just like you would with any regular calendar and it will begin the process. It will try to add in the contact information of who you’re meeting, as long as they’re in your phone’s address book, scan to find any relevant emails from Gmail, Yahoo, or Exchange-supported email accounts you’ve authorized, and assign a location using Foursquare data. 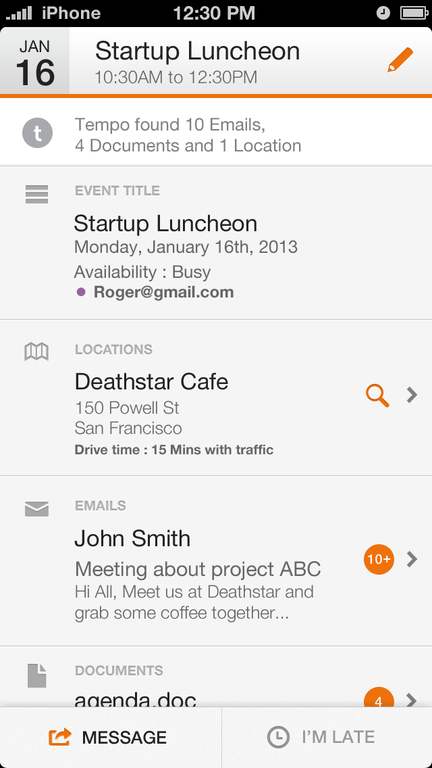 The app will also display any social media accounts for meeting attendees, including LinkedIn profiles. And if you’re running late, the service has a notification feature that will send either an email or an SMS text message to attendees letting them know. It’s important to note that when you first install the app, there will be a “one-time pause” while it onboards your calendar, contacts and email. At each stage, you are given a choice as to what information you wish to provide Tempo. The company says that within the app, routine tasks are done with the fewest possible taps because Tempo will know what needs to be accomplished. In fact, Tempo tells us that up to 80 percent of the common type of meetings are supported by the app, including birthdays, team meetings, one-on-ones, breakfast/lunch/dinner appointments, and dinner meetings. Singh says that Tempo will most likely utilize a freemium model whereby users would pay for additional integrations into services like Google Drive and Evernote. The app is only available for the iPhone and the company currently does not have plans to roll out an Android or Windows Phone version any time soon.